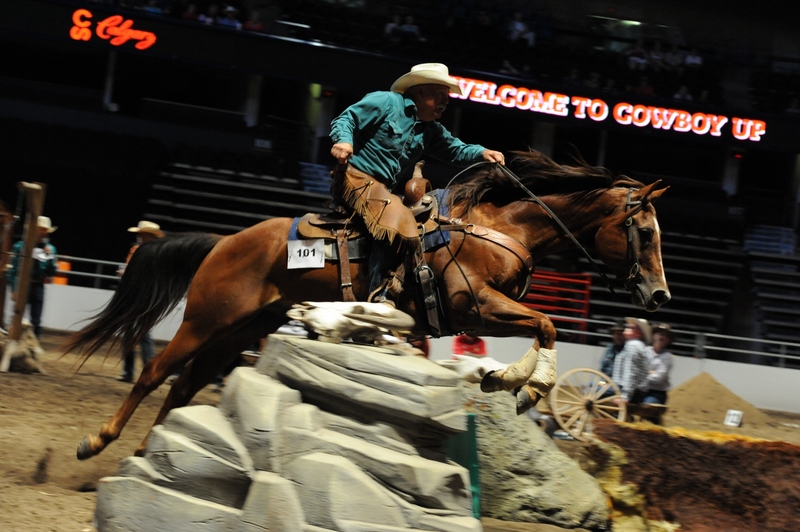 Glenn Stewart of Baldonnel, B.C., in saddle, captured the Calgary Stampede’s inaugural Cowboy Up Challenge in July 2010 riding his stallion, Genuine Jet Smooth. The horse trainer and clinician is in the mix again this year, after winning Saturday’s first round at the Scotiabank Saddledome. CALGARY STAMPEDE – OK, OK, time for Glenn Stewart to come clean. When Stewart won the Calgary Stampede’s inaugural Cowboy Up Challenge last July over some of the brightest lights of the Extreme Cowboy Association (EXCA), it was billed as somewhat of a David-versus-Goliath victory. But Stewart, from Baldonnel, B.C., has an extreme streak of his own. “We have our own little circuit. We don’t call it Extreme Cowboy Racing, but we’ve been having our own horsemanship competitions for eight years,” says Stewart of the Extreme Horsemanship Canada circuit, which he operates from his own home base in northeastern B.C., The Horse Ranch. For the past five summers, the Extreme Horsemanship Canada series has made tours across Western Canada, making stops in Smithers, B.C., Eaglesham, Alta., Stonewall, Man., Winnipeg, and Saskatoon, with Stewart – a longtime natural horsemanship clinician – in charge of course design, judging, and emceeing. In March 2010, Stewart placed third during the Craig Cameron Extreme Cowboy Race Clinic at the Corral on Stampede Park from a field of 20 locals. 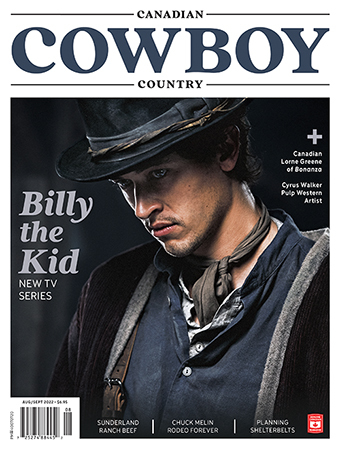 And in July, he grabbed the spotlight from American heavy hitters such as Robin Bond of Vista, Calif., Bill Cameron of Rosamond, Calif., and Sally Addington of Polk, Penn., by winning the Stampede’s Cowboy Up Challenge – the first Extreme Cowboy Race held on Canadian soil – aboard Genuine Jet Smooth in the Scotiabank Saddledome. As Extreme Cowboy Racing continues to gather steam in the U.S., Stewart is back to defend his Stampede title. With Saturday’s and Sunday’s preliminary go-rounds now in the books, the stage is set for the second annual Cowboy Up Challenge championship final on Monday, July 11 at 3 p.m. at the Saddledome. Extreme Cowboy Racing, sanctioned by Bluff Dale, Texas-based EXCA, is the brainchild of Cameron, known as the “cowboy’s clinician,” and originated as a TV program in the U.S. It’s the fastest-growing sport in the equine industry, and more than 100 EXCA events were held last year from Hawaii to Alberta to Maine. A timed and judged event, Extreme Cowboy Racing demands both horsemanship and speed, and challenges both horse and rider with an obstacle course that may include such challenges as moguls, bridges, log crossings, tunnels, cowboy curtains, roll backs, and water crossings, among others. Judges award points for each obstacle, on a scale of one to 10, based on criteria such as horsemanship, cadence, control, and overall execution. Horse-and-rider teams are required to complete each obstacle within a predetermined time period to collect points. As with other EXCA events, all three rounds of competition at this year’s Cowboy Up Challenge feature a different course layout. Following Sunday’s second go-round, the stage is now set for Monday’s final – with 12 horse-and-rider teams set to attack the Saddledome course in pursuit of the $7,000 winner’s cheque and coveted Stampede buckle. Stewart, who won Saturday’s first round of competition on Genuine Jet Smooth, is back among the top 10 qualifiers for Monday’s final, a list that also includes Runt Rageth of Harris, Mo., and Burdock, James Anderson of Strathmore, Alta., and CK Olena Doc, Robin Bond of Vista, Calif., and I’ll Cowboy Up, Steven Barrett of Wheatland, Ind., and Mr. Genuine Doc, Teala Caton of Eckville, Alta., and Marshmellow, Chris Redden of Ravenwood, Mo., and Wrangler Baron, Kateri Cowley of Exshaw, Alta., and Kokanee, Corinne Lindquist of Perris, Calif., and The Master Cure, and Tammy Botsford of Chestermere, Alta., and Dez Add To The Assets. Also advancing to the final are a couple of wild-card entries – Russel McKenzie of Eckville, Alta., on Quincy Dan’s Dancer, and Adrian Neufeld of Olds, Alta., on Valenfire’s Attractive Image. Scores over the first two rounds will be wiped out, and all teams will start Monday’s championship with a clean slate.